I grew up in a family where mom and stepdad were alcoholics. Although all seven of us kids were the subject of physical and verbal abuse, my oldest stepsister and I bore the brunt of that abuse. That was the main cause of me acting out and becoming one of Utah’s greatest (?) juvenile delinquents. Once my wise old grandmother adopted me—I was just three months short of age 11—and gave me love & discipline, I recovered. One thing that my wise old grandmother taught me during the eight years she had me was zero tolerance for abuse, whether that be verbal or physical abuse of people, even adults, or abuse of fauna, flora, or even property. Early yesterday morning I drove about twenty miles south to visit—and get pictures of!—San Diego Historical Landmark #13. It was pretty cool! Blog post coming soon! When I got over to the fence, I realized that it was a dog, a dog very happy to see me. I found a gap between the fence and a gate and got the dog out. Friendliest little thing, but obviously scared, and emaciated…. no collar. As I was looking around trying to decide what to do, the guy looked back, saw me with the dog, and came back to us. As he got closer to us, the dog took off after him. I made the presumption that the dog belonged to him, but because of the dog’s emaciation—as well as my first thought of abandonment by the guy dropping the dog over the fence—I followed them for a little ways. All seemed to be well, but as I walked back to my car—a good 30 minute walk—I kept thinking about that emaciated dog. Back at the parking lot, I found some firemen on break and talked to them about the dog. They gave me Animal Control’s number. I drove my car back to the ballparks where I had seen the dog, parked, and walked to the ballparks. 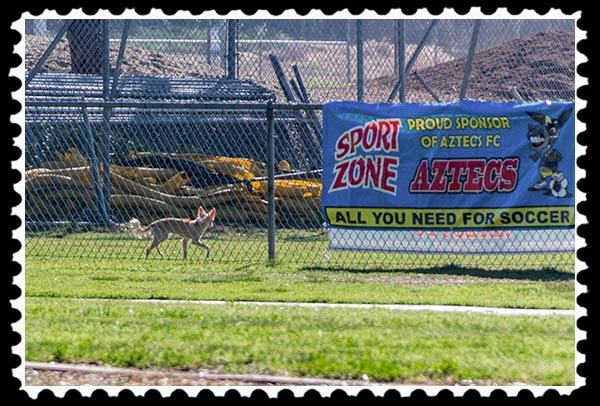 Sure enough, the dog was back in the ballpark, behind the chain link, trying desperately to get out. The guy was nowhere around, so I called Animal Control and reported an abandoned dog, and what had happened. It took them all of 17 minutes to get to the park. They rescued the dog, confirmed that it was in bad shape from lack of food, and took it away. I am so sorry that I did not take a picture of the guy to give to Animal Control. People like him are evil, should be prosecuted, and then locked away for at least a little while….That’s my opinion, and I’m sticking with it. Check out Photographic Art by Russel Ray Photos. This entry was posted in Opinion, Photos, Picture of the Moment and tagged animal abandonment, animal abuse on February 4, 2015 by Russel Ray Photos. I’m 120% with you and admire you for persisting in doing the right thing. Friends think that I sometimes exaggerate when I say that bad things done to animals are worse than those done to people, but given who we are and that technically we are more capable of defending ourselves, I can’t be too far from the truth. That guy was definetely evil. With luck, he’ll get his due soon enough. Law enforcement will tell you the same thing. Animals are often murderers’ and serial killers’ first victims. I agree with you 100%. What I don’t understand is why people just leave animals out to survive on their own where there are so many shelters that will take them in. Our office kitty, Miranda, is one of them. She showed up at our office one day and at first we thought she might belong to someone in the apartment buildings next door. But when she kept coming to our office we started feeding her and finally realized she was homeless. She was very friendly so we knew she wasn’t feral. We took her to the vet and found out she had a chip. . . but phone calls to the three contact numbers showed they were all disconnected. So she became our indoor office kitty and we have all been better for having her here. I just don’t understand why someone left this beautiful, friendly kitty out to survive on her own. I think sometimes they are simply embarrassed to take an animal to a shelter and surrender it, thinking that they were a failure at taking care of an animals. They are probably right about the failure part, but abandoning them is just so cruel. You did the right thing! Thank you! I so wanted to take that little one for my own but I just don’t have the room for a dog here, even a small one, and I don’t think I could give it the love that it needs and deserves. But it sure was cute! No matter what people say, there is evil and bad in the world. If everyone would simply do what they could to counteract it in their own area, it might get better. Thanks for not leaving the dog and hoping for the best. You saved a creature who always offered love and devotion and asked for nothing in return – and was thoughtlessly abused. I’ll never have as many crowns as my wise old grandmother acquired, though! They were a whole different breed. Good for you, well done for actually doing something about it. I forgot to mention that I’ve also appreciated your candor talking about your upbringing. It certainly takes guts. I find it fairly easy for three reasons: (1) Most everyone is dead, (2) Those who are not dead are not part of my life anymore, and (3) Maybe my candor can help someone who’s going through similar difficulties. I’m behind you all the way and then some. Last summer, I was out working in my yard. A man comes walking by (we are in an outoftheway area and people often walk back here). he was dragging a sorry looking, cowed, emaciated dog behind him. I immediately perked up. He turned because the dog had gone down to he ground and kicked it. Turning my rake around to the wooden part, all 4″10″ of me hurtled across the yard and over te drainage ditch. I yelled, HEY and he turned. I was even with him by then and hit him hard, across his knees. I hit him when he went down on one of his elbows. I took out my cell and took several pics ohim with the dog and when he started getting up, I told him to get back down. I called 911 and reported a man down in the road. I told him if he moved, I’d hit again. he was angry and cursing me but obviously was a coward. I’vve had several years of Kendo so I do know how to weild a stick and well. The poor dog justlay there, still. I ran and got it a bowl of water and some cat food. It was so thirsty and hungry. By that time, the police got there. he started yelling, big coward. They looke at little me and aked what happened. I told them I had beaten the crap out of the man and why. They lookd at the dog and then the man. It was obvious he was taking the dog to the woods to tie up and leave to die. The man was yelling again. One of the officers said, poor guy, tripped and fell and rolled. The called SPCA who came immediately, took their own pictures and took the dog. The police told the man to leave and that if I EVER had any trouble from him, they’d know what to do. I never heard anything except a month later, I saw the dog up for adoption on their site. He looked well and happy and they described him as “pure sugar”. My husband lectured me but he knows how I am. and he knows I know how to hit with a stick. We can’t turn out backs on evil – whether it is another human or animal being abused. If we do, we become the evil. Hugs to Jim and the Cool Cat. You are my new BFF! I know I shoujldn’t have, but I just have this thing about the helpless and innocent being harmed. I don’t know if i’d do it again. But I can’t stand cowards and bullies…they never expect to not get away with what they do. Whoa, Kanzensakura, I’ve got say it, you’ve crossed the line on that one, despite your good intentions. No matter what, it’s not your right to hit someone because he or she’s doing something you disapprove, or you assume that they’re about to do a bad deed. I think that, in retrospective, you may agree with me that your actions were impulsive and dangerous- specially because, as you said, you took ‘years of Kendo,’ which you’ve probably been told at least once, it’s like carrying a lethal weapon on you. Don’t get me wrong, I’m glad you’ve saved the dog and all that, or that maybe even I would’ve done the same under similar circumstances. But that doesn’t make it OK, because you put yourself and others in danger (what if the man was armed? ), and the whole thing could’ve ended up in tragedy. I hope you’ve meditated long enough on that episode, so you know that it was definitely not one of your best moments. PS: Upon reading it, it does sound all a bit sanctimonious; I’m sorry, didn’t mean to troll you. Feel free to discount a chunk from what I’ve just said. We’re all flesh and blood, after all. What a good deed, Russel. Well done. Thanks. I just wish I had been thinking clearly and had gotten a picture of the guy but I was so concerned about the dog…….. I agree. Thank you for taking the time to care for that little guy. Thanks for commenting, Dan. It’s always good to find support for one’s actions. The things some people do are so disgusting. Thank goodness for Wise Old Grandmothers and the Russels of the world. Sadly, it’s the same way here with most of the shelters. Black cats and pit bull breeds are the ones that find it so hard to get adopted. I love these stories with happy endings. We have two rescues of our own and they’re awesome. Good for you, Russell, for saving that cute doggie. Your wise grandma must look down at you with such pride! 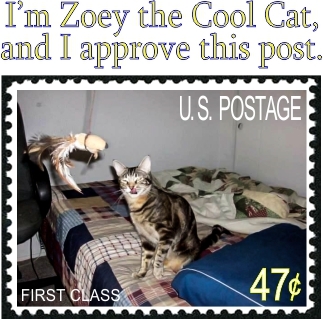 Zoey the Cool Cat is my only rescue cat. All of my other billions of rescues have been dogs, snakes, birds, rats, a skunk (wise old grandmother didn’t like that one at all! ), and such. I am so glad you went back and got the dog help! Great story! She died at the age of 93, but even that was too soon! So glad you did what you did. Sometimes the human race horrifies me. At one time the Internet was really exciting. That was when only 200 million or so had Internet access. Now, with six billion people having Internet access, and 1.4 billion of them on Facebook, it is so disheartening to see just what goes on in the world, both with how people treat other people and how they treat defenseless animals. It is pretty awesome, though, when a video shows up of a deer striking back at a hunter, a couple of dogs getting after a human who was hurting another dog, etc. Thank goodness you were rescued by your Grandmother. Abuse is something which can so easily get repeated. I so relate to your story having experienced abuse as a child and like you, I will always fight for the vulnerable. I have to confess that I do not have good thoughts about the kind of man you describe. And if frightens me what someone like him is prepared to do. But you so did the right thing, you did not give up on the little dog. I have taken in two cats who were just dumped. They have been the greatest gifts and have enriched my life. It is so sad that the man you encountered is not able to give or receive love and will never be able to let love into his heart. I wish he could be punished. And you won’t hear me disagree. The only time I sometimes feel I could really hurt my dog is when she drags me out of bed at 5:30am, but of course I never do! All animals deserve respect; a respect I also extend to plants and trees – I’m a hopeless gardener! My Vegan friends would not be happy with you and your respect for plants and trees. I say that because they are not happy with my respect for plants and trees. As I see it, humans rule the Earth, but that doesn’t mean we have to be cruel. Yes, I eat flora and fauna, but I give them the respect they deserve while they are living and before they become sustenance for my body. This makes me so angry and so happy – thank you for checking back and saving that poor do! Doh! I meant DOG!!! It is early here in Illinois!!! I’m just happy that I had a hour to spare and wasn’t in a rush to get anywhere. You did do the right thing and now that dog can find a forever home. It is not always easy to see what is in a persons heart, you had no way of knowing that the owner was trying to abondon the dog. Your grandmother raised a nice, caring, compassionate person. I so wanted to take the little one with me but I just don’t have room. How I want to win the lottery so I can buy a huge slice of land and create a dog and cat sanctuary……. We say the same thing! Blessings for a good week. Thank you for being so caring and making sure the poor thing was looked after. I hate to think the abuse it’s had to live thru. I hate that there are people like this, yes pure and callus evil. I don’t know how they live with themselves. Thank goodness you were there at the right time Russell. I know how you feel. I accept that there is evil but never watch the video’s. If something bad comes on TV, I have to plug my ears and Jim Fast Forward. It’s not ignoring the problem, it’s just that these things will haunt me for months. Exactly. I know it exists. I don’t need to watch videos of it! I remember when I first realized my love for wildlife. My cousin, seven years younger than me, lived in a family with guns. They had more guns that the United States Army. When he was six (I was 13! ), he used to take me “hunting” with him. All he would do is search for bird nests and fill the nest full of beebees to destroy any eggs or birds in it. Then, later in years, he would use his pellet gun, then his 30-06. I never went with him after the first couple of times, but he would do the same thing around the yard and ranch, so it was impossible to miss completely. That sounds really sick, RR. The idea of shooting eggs and birds that aren’t harming anyone is evil. My husband has it in for squirrels and gophers that eat up his yard, and he’s not big on insects either. Shooting for sport, though seems cruel. I killed a rat once that was chewing on our wall. I felt sick about it. As it turned out, a neighbor’s car thought it was great, and the rat was gone before my husband came home from work. (I had left the garage door open.) He asked me what in the world happened because our garage looked like a murder scene with no body. Zoey the Cool Cat’s predecessor, Sophie, was a feral cat which adopted us. We tried to make her an indoor cat but when the sun when down, she wanted to be outside, and she would howl like a coyote until we let her out. She was a champion gopher catcher, four or five gophers a day. I’m pretty sure I didn’t have that many gophers on my piddly 2 acres. Yeah, she played with them before killing them. If I caught her playing with them, I would gather them in a box and put them over the back fence where there were several acres of woodland behind me. Don’t know if it did any good but at least I felt better, especially since Sophie got enough food at our house anyway without the gopher supplement. Sophie’s pretty slim. I think they get slimmer eating gophers and lizards. Our cats look amazing right now with all their fur. Even poor Cross-Eyed Kitty looks great, and he must have cancer. He is the feral cat in our neighborhood. He comes for a few days, then takes off again, maybe for 3, 6 months or more. Then just when we think he died, he shows up. There’s a special place in hell for people like that. You’re a good, brave person Russell.